If you use your iPad or iPhone (or both!) onstage when you perform, you know how hard it can be to find a good place to put them. Putting your iPad on a flimsy music stand just won’t cut it, and leaving your iPhone on the floor near your guitar pedals is just asking for a stomped-on smartphone. 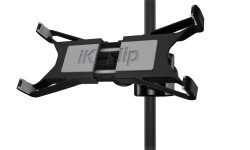 The solution, for me, has always been iKlip iPad stands, which connect right to my mic stand. The new versions, including a sweet new iPhone mount, keep my iPad and iPhone safe from all musician-based harm, and always at the right height and angle to get at my lyric sheets, set lists and guitar effects. The new Xpand models have definitely upped the game in terms of ease of use and storage. They’ve got the same ball-joint connector for the actual clip that holds the iOS device, as well as the same microphone stand connecting system that keeps things solid on the stand. All in all, this is a vast improvement on an already stellar, useful musical peripheral, and has quickly gained a spot on my mic stand at every gig. What’s new, however, is the expanding mounting clip that holds your iPhone or iPad in place. This is a spring-powered beauty of design covered with soft, nonslip, rubberized material that safely grips your iPad onstage and won’t let go. Both the iPad and the iPhone version (Xpand Mini) of the mount can connect to microphone stands either on the vertical pole or atop a horizontal boom attachment. The grip mount is a vast improvement over its predecessor, in that you can securely hold your device even if it’s in a case. 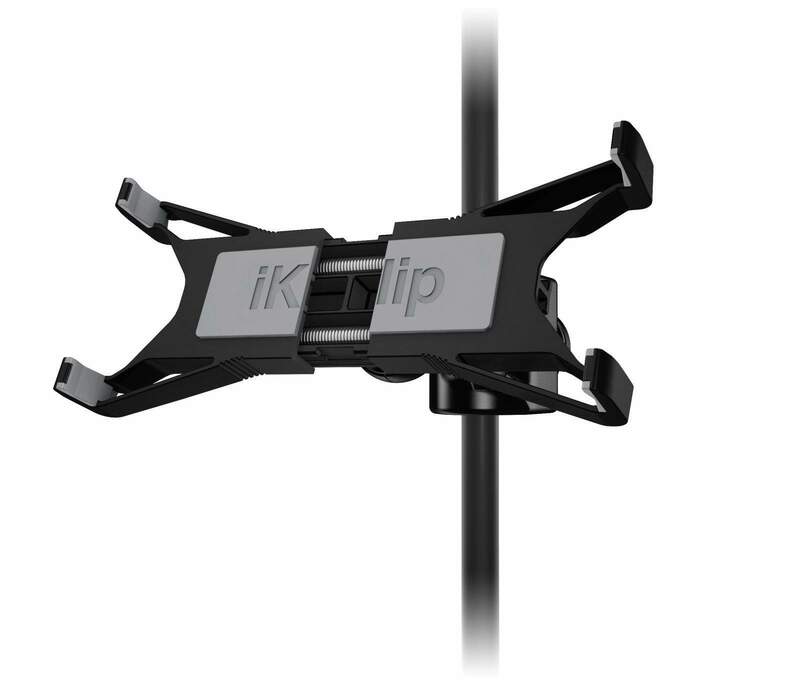 The previous iKlip required you to strip down and slide a naked iPad into it’s spidery arms, which kept everything safe, but was a pain if you wanted to just slap your iPad up there and start playing. The new model also fits into my gig-backpack much more easily. The iPad-size Xpand will hold any tablet, really, from 7 inches to 12, while the iKlip Xpand Mini will hold any smartphone or phablet you can throw at it, up to 6 inches. All in all, this is a vast improvement on an already stellar, useful musical peripheral. The Xpands have quickly gained a spot on my mic stand at every gig I’ve played since I got them. 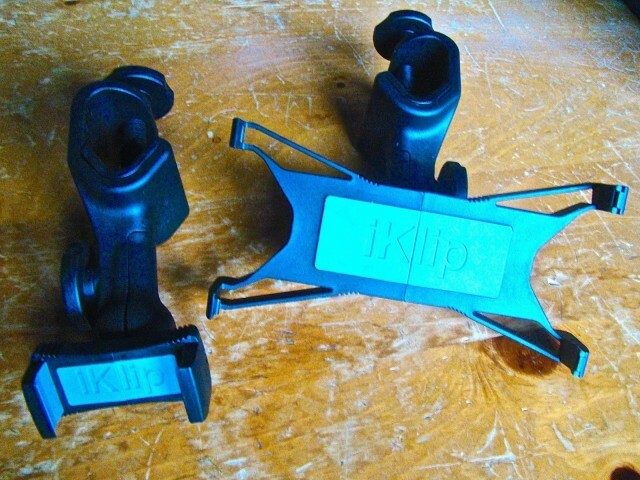 I’ve passed along my iKlip 2 to the backup singers, so they can follow set lists and lyrics. Makes for much less crowding at my mic. If you need to keep your iPad or iPhone at the ready when you’re using a mic stand onstage, you can’t get any better than this. It’ll be the best $40 (iKlip Xpand Mini) to $50 you’ve spent, aside from all those cool guitar pedals and apps to make even cooler music. The good: These will grab your iOS device and never let go; solid design will last longer than your bandmates. The bad: None, unless you don’t use a microphone stand. The verdict: Best cash you can spend if you use your valuable iOS devices to rock.